In an age when the adult populations of most industrialized nations have grown significantly taller, the average height of black women in the U.S. has been receding, beginning with those born in the late 1960s. The difference in stature between white women and black women has now stretched to three-quarters of an inch and appears to be increasing, according to newly released data from the National Health and Nutrition Examination Survey (NHANES) conducted by the federal Centers for Disease Control and Prevention. I believe we have found evidence of this fact; although this example is quite dramatic and not typical of the height lost among Black women. A much younger Will Smith and Jada Pinkett standing barefoot on the beach at the beginning of their relationship more than 10 years ago. 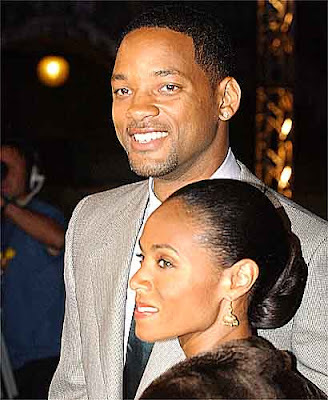 Will and Jada at a recent Hollywood movie premeire. SHOCKING! !